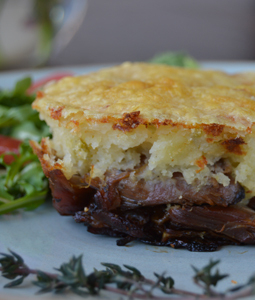 Duck Leg Confit Parmentier - A recipe from Savor California, the online showcase for extraordinary gourmet foods and beverages from California. Bring a large pot of salted water to a rolling boil. Add the potatoes and return to a boil. Simmer until very tender, about 30/40 minutes depending on size. (It will be easier to mash them if overcooked). Drain well and let them chill for a few minutes. Peel potatoes and mash them with a potato masher (or a fork) until they are broken up. Mix butter into potatoes and slowly add milk. Season with nutmeg, salt and pepper. Note: Don’t overbeat the potatoes or they will turn into a sticky and rubbery paste! In a saucepan, warm up the duck. When hot, remove it from the pan, leaving the fat in the pan to cook the onion. Finely chop the onion and fry gently in the duck fat until just golden. While onion is cooking, separate duck meat from skin and bones with the help of a fork. Then shred the meat. Add the shredded duck meat and onions to the pan. Season with cracked black pepper and thyme. Stir well and simmer for approximately 2 minutes. Lay the duck and onions mixture in an ovenproof dish. Top this mixture with the mashed potatoes. Flatten the potatoes to create an even layer. Sprinkle with cheese. Bake in the oven for 20/25 minutes, and finish under a hot grill until golden brown. Serve hot with a green salad on the side – and of course with a red wine from the South West of France.